Have you ever wondered why the past tense of walk is walked but the past tense of “catch” is not “catched” but “caught”? Well, “walk” is a regular verb while “catch” is an irregular verb. Yes, English is one tough language and its rules are sometimes complex. 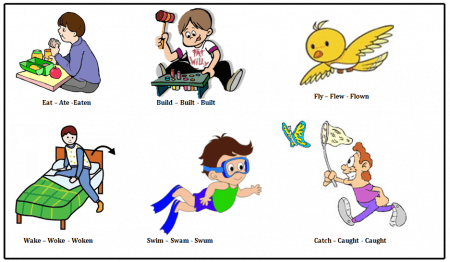 This article will discuss the difference between the two types of verbs. If a verb ends in a consonant or a vowel except “e,” add -ed. For example: veto (simple form) – vetoed (past tense) – vetoed (past participle); fart (simple form) – farted (past tense) – farted (past participle). Add -d to the end of the word if the verb ends in “e.” For example: confuse (simple form) – confused (past tense) – confused (past participle). If a verb ends in “y” following a consonant, change the “y” to “i” and add -ed. For example: stupefy (simple form) – stupefied (past tense) – stupefied (past participle). If a verb ends in “y” following a vowel, add -ed to the end. 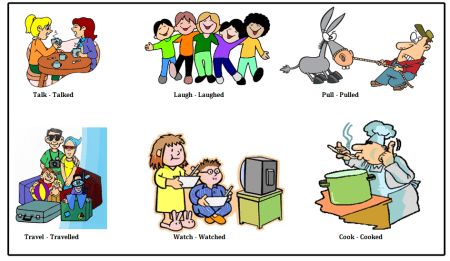 For example: stay (simple form) – stayed (past tense) – stayed (past participle). If a verb has one syllable and ends with a consonant, double the last letter and add -ed. For example: ban (simple form) – banned (past tense) – banned (past participle); trim (simple form) – trimmed (past tense) – trimmed (past participle). Some irregular verbs do not change in spelling. For example: cut (simple form) – cut (past tense) – cut (past participle); reset (simple form) – reset (past tense) – reset (past participle). Other irregular verbs do not change in spelling, but the pronunciation changes. For example: read (simple form) – read (past tense) – read (past participle). Some change in spelling, but the simple past and past participle are the same. For example: dig (simple form) – dug (past tense) – dug (past participle). Several irregular verbs do not have a pattern at all. For example: go (simple form) – went (past tense) – gone (past participle); rise (simple form) – rose (past tense) – risen (past participle). Because irregular verbs do not follow a consistent rule, the best way to learn them is to memorize or familiarize yourself with them. When you are confused, it’s always best to look in a trusty dictionary. What, then, is the difference between regular and irregular verbs? The fundamental difference between the two lies on the formation of their past tense and past participle. Regular verbs follow the standard rule of adding -d or -ed to the end of the word to form both past tense and past participle. On the contrary, irregular verbs do not follow consistent rules. We do not add -d or -ed to these verbs at all. Their spelling or pronunciation may change, or they may also transform into a totally different word. The best way to learn irregular verbs is by memorization or familiarization, while following the -d or -ed rule is the best way to learn regular verbs.